The Fed has proven it does not control the stock market. The Fed has proven it does not control currencies. 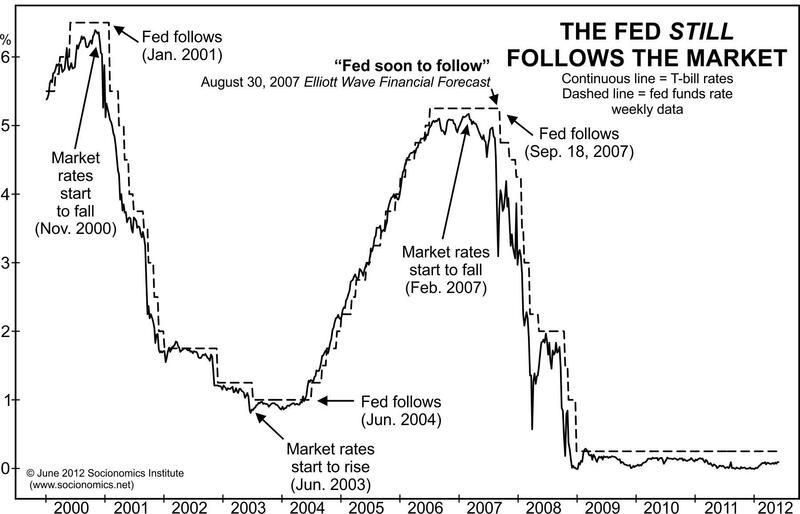 The Fed has proven it does not control rates. After the market crash of 1987, President Ronald Reagan created the President’s Working Group on Financial Markets to recommend solutions for enhancing U.S. financial markets, preventing significant volatility, and maintaining investor confidence. The group consisted of the Secretary of the Treasury and the Chairmen’s of the Federal Reserve, the Securities and Exchange Commission and the Commodity Futures Trading Commission. Thereafter, this “Working Group” became known as the Plunge Protection Team, and many believed that this “Team” would intervene at the appropriate moments to prevent significant volatility in the markets, which would, thereby, prevent market crashes in the future. As the myth has been perpetuated, it can supposedly do this by convincing banks to buy stock index futures, or by having the Federal Reserve do the buying. The goal was supposedly to allow markets to correct in an “orderly” fashion so as to “maintain investor confidence” in our equity markets. May of 2010: Equity markets experienced a “Flash Crash.” Specifically, the market started out the day down over 30 points in the S&P 500 and proceeded to lose another 70 points within minutes. That is a loss of 9% in one day, but the market did manage to close down only 3.1% in one day! Based upon these facts, you can even argue that significant stock market “plunges” have become more common events since the advent of the Plunge Protection Team, especially since we have experienced more significant “plunges” within the 20 years after the supposed creation of the “Team” than in the 20-year period before. So, even with all that QE being thrown at the dollar, we still saw the massive rally in the DXY that I was expecting. Yes, this was certainly counter-intuitive to common market expectations. But this was a clear case study in the fact that the fundamentals or the Fed did not control this market, while market sentiment was the clear driver of price, as our analysis of market sentiment kept us on the correct side of what was an “unexpected” market rally. Moreover, as the Fed began rate hikes, many were certain that it will be a catalyst for the dollar to rally strongly. However, I was looking for the dollar to enter into a multi-year pullback once we struck our long-term target. Now, despite the Fed raising rates, once the market slightly exceeded our long-term target (the high struck in the DXY was 103.82, whereas our target from 2011 was 103.53), the DXY began to pull back as we have expected. Yet, most who believe that the Fed controls this market seem to be in disbelief, as the DXY “should” have been rallying when the Fed was tightening. You see, commonly understood economic theory suggested that reducing the available debt through the QT process “should have” caused the dollar to rally. But, clearly, that is not what happened. The same has happened with the Chinese Yuan. By the middle of 2017, China spent 1 trillion US Dollars (a quarter of their FX reserves) over the prior 3 years in an attempt to prop up the Yuan. However, the Yuan still lost close to 14% of its value against the USD over this time period. Ultimately, when truly tested, as in the situations above, the markets have moved completely opposite the “manipulation” attempts by the central banks. They have proven themselves powerless in the face of market forces. The market will do what the market will do despite the actions of the Central Banks. Believing otherwise is ignoring the truth in the market as presented by history and price action, and replacing it with the logical fallacy that correlation equates to causation. But I can assure you that those that maintain these fallacious beliefs will feel significant financial pain when the next crash does occur, and the Fed will be powerless to stop it. Now, in November, you will see that we hit my “Major Support” target in the TLT. But, as I explained in the chat to my members, I thought we would get one more lower low. In fact, I noted that I was going to be a buyer at the 113 region in the TLT, with my longer-term target represented by the box in the upper right side of the chart. Again, take note that my expectation was that we would see a rally off this support region. Moreover, consider that this was during a period of time in which the Fed was quite clear of its intentions to continue raising rates. The Fed Was Never Really In Control??? ?